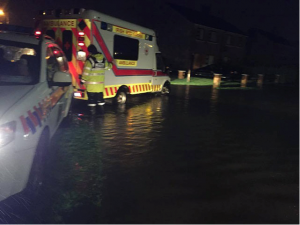 KERRY – A full scale operation involving many of the emergency and voluntary services was underway in County Kerry as many parts became flooded. 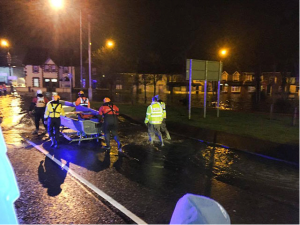 Affected areas were Ballymullen, Castlemane Road, Killarney, White Bridge, Ballycasheen and also at Knocknaboul Bridge. Approximately 50 members of the Civil Defence and 20 operatives from Kerry County Council were deployed following activation by the Major Emergency Management (MEM) team yesterday. Kerry Civil Defence mobilised all of its units. 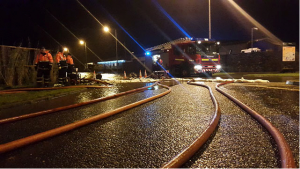 The Auxiliary Fire Service (AFS) assisted Kerry Fire & Rescue Service with pumping water in the Ballymullen area of Tralee. Other members continued to fill additional sandbags which were being used in affected areas. Kerry County Council became concerned for the welfare of those stranded in their homes affected by flooding. 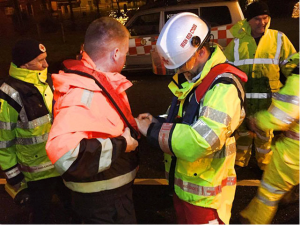 The MEM requested assistance from the Irish Red Cross who sent teams of twenty volunteers from Tralee and Mallow, Co. Cork to assist the civil defence in house-to-house welfare checks and ascertain whether any evacuations were required. One incident of an emergency evacuation was required and an ambulance was mobilised to assist. This area of operation was coordinated by Kerry’s Civil Defence Officer Tom Brosnan through the regions Inter-Agency Emergency Coordination Unit. 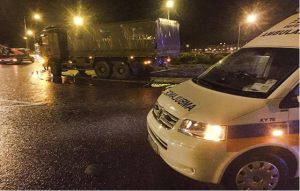 Later in the evening as conditions worsened, the Defence Forces and a local boat unit were also activated to assist in the emergency while on-going assistance was being provided by the National Ambulance Service and the West Cork Rapid Response Doctors. 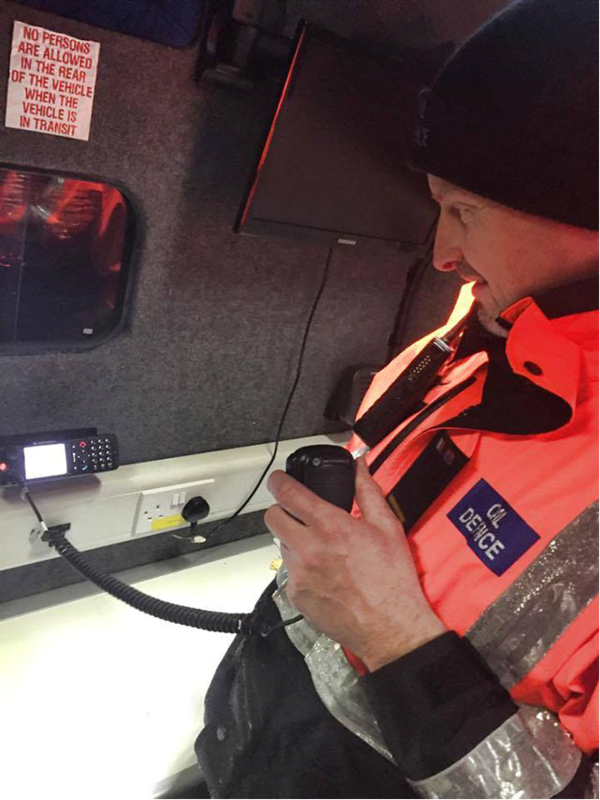 Communication between all agencies was a crucial element throughout the flooding response and the Major Emergency Management team have acknowledged and thanked TETRA Ireland for their priority assistance in providing ‘talk groups’ on the TETRA network through the Garda and the National Ambulance Service radio networks, which enabled the local coordination team and Civil Defence to communicate directly to all services on the one network when required. According to Paul Baynham, Operations Commander with Kerry Civil Defence, this facility was a valuable asset to the operation. “We had 11 TETRA’s in use and everything was being logged on situation boards in HQ and n the MEM unit. The MEM unit was acting as a go-to point for new crews landing on site and also as a registration point for evacuees” he said. The call-out response in Kerry was downgraded as Met Éireanns ‘Status Red’ alert ended at around 3am this morning. The Civil Defence Officer (CDO) implemented a rota system which released volunteers from duties to allow them to dry off and get some hot food and rest. The welfare service provided hot food throughout the day and night, to almost one hundred volunteers, fire fighters gardai and council staff working during the floods. The overall operation was coordinated by Kerry CDO Tom Brosnan. Mr. Brosnan has praised all the volunteers from all services for their fast response and continued and valued contribution. Crisis Management teams in Local Authorities and other agencies are expected to hold meetings tomorrow morning as part of the emergency management plans, to the response and delivery of service in affected areas.